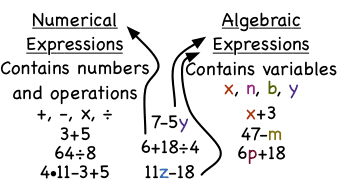 What Are Numerical and Algebraic Expressions? An expression is just a mathematical phrase. In this tutorial, you'll learn about two popular types of expressions: numerical and algebraic expressions. A numerical expression contains numbers and operations. An algebraic expression is almost exactly the same except it also contains variables. Check out this tutorial to learn about these two popular kinds of expressions! How Do You Use the Order of Operations?